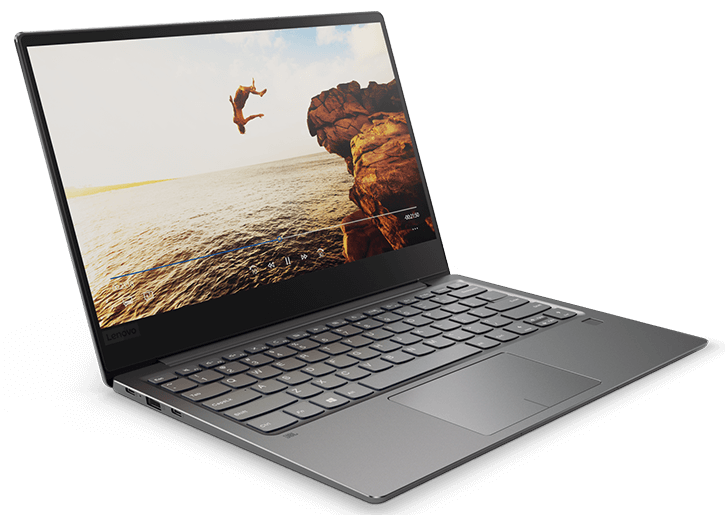 This article is going to bring Lenovo Ideapad 730s review which includes the details of this newly announced laptop along with its specifications and other details. This device was announced basically as Yoga S730 and still being marketed with the same name. Lenovo Ideapad 730s is actually a 13-inch notebook which delivers almost all modern hardware and features inside. Talking about the body, it’s completely a slim and light laptop with aluminum body. This notebook may seem even better when its price is considered which is $720 on wards. Under this budget, there are many rivals available in the market as well however they are bulkier to this. Apart from being cheap, Lenovo Ideapad 730s also supports with various advance features like touch display, pen support, IR camera and many more. Coming to Lenovo Ideapad 730s review about its specifications, the notebook sports Intel Core i5-8265U processor, 8GB of DDR3 RAM, and a 256GB of ROM. This Lenovo Ideapad 730s price is seen as $800 at its official website. Here comes the technical specifications of this notebook. Lenovo Ideapad 730s has a great appearance with unibody aluminum design which seems very slim and light. The display also sports minimal bezel that makes the notebook as really a smart option if a user is seek a laptop that can slip into their bag without being noticed. Since its weight is also just 1.1 kg, it will be a great alternatives to all its rival under its price tag. Ports selection in this device can be somehow limited because of its slim design. The 2 thunderbolt 3 ports are on the right side and a standard USB-C 3.1 and a 3.5mm audio jack is on left side. All included ports in Lenovo Ideapad 730s allows users to charge which offers extra convenience. Moreover, there’s too a fingerprint scanner allowing users to utilize Windows Hello. Using this feature, its user can easily login without taking much time as traditionally used while inputting passwords or pins. There’s no IR camera included in this lappy however its front facing 720p webcam above the display. But, the camera is not so great that you can easily tend to turn others saying wow during conference call. Getting to the bottom of Lenovo Ideapad 730s. There can be seen a wide vent for heat exhaust and dual 2-watt bottom facing speakers. These speakers are also certified with Dolby Atmos branding and do a great job to deliver sound. Coming to its display, Lenovo Ideapad 730s is included with just one option which is a glossy finish. It sports a non-touch 1920 x 1080 IPS LCD panel. This panel allows users to get wide viewing angles, brightness hits around 300 nits which is probably good for most of the cases, but not is suitable for brightly-lit circumstances. Talking about its sRGB color reproduction, experts have got back 100 % sRGB and 76 % AdobeRGB during tests, which is probably an outstanding results for everyday usage. 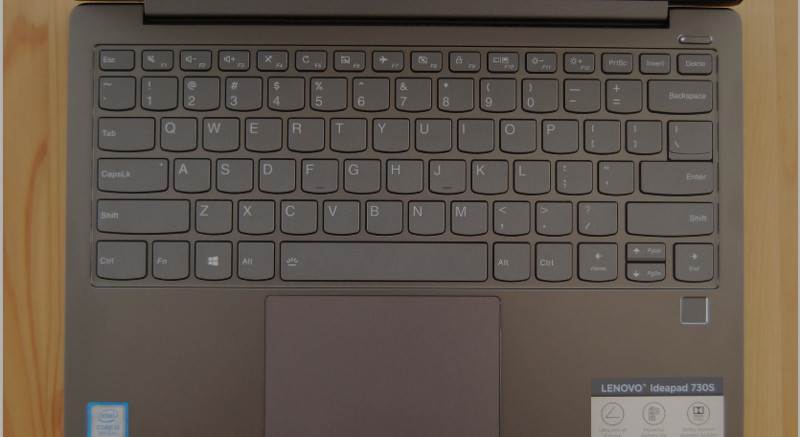 Lenovo Ideapad 730s sports quite large touchpad in compariso of rest of the laptop which allows users to get plenty of space for Windows 10 gesture support. The touchpad supports Microsoft’s Precision drivers and can track without any flaw. However, the smoothness is a bit disappointing in compare to other laptops. Taking the keyboard in consideration, it seems probably of similar quality as Lenovo offers. That means, the keboard is well spaced with large keys, full function keys, and off course a button to control backlight at three levels. Overall keyboard specification is comfortable for long duration of usage. Talking about the performance from Lenovo Ideapad 730s, since it uses 8th Gen CPU with quadcores of power, it’s expected to deliver excellent performance. The laptop is available in two options that are Core i5 as well as Core i7. Presence of 8GB of RAM (you can also get it upto 16GB but can’t upgrade it due to being soldered on motherboard) makes it able to handle a considerable number or concurrent processes flawlessly. there’s probably not much space for battery in the chassis, so it includes 42Wh battery, still the laptop can be used for around 8 hours after fully charged. This great backup can be obtained with balanced power plan if active. Charging the battery is even easier because just an hour of charge can bring most of the battery life back. So, in case if you are seeking a notebook with sleek design still a great display, modern ports, then investing over Lenovo Ideapad 730s can be a descent option. Performance-wise, the laptop can even be compared with other brand models available under higher price tags. it’s priced at around $750 onwards, and in case your budget is really under this range, then this modern notebook is really the best option. Hope you liked this Lenovo Ideapad 730s review here. Do Subscribe Us to stay tuned with more similar reviews and technical articles.